At first glance, it looks like something from a sci-fi films – an entire nebula trapped inside a stone. However, in fact the incredible object is an opal, found in Oregon. ‘The clear, transparent crystal body having a fine, firey play-of-color that is gem quality,’ the auction house said. Contraluz is opal where you see the play of colors suspended inside by illuminating the back of the stone. 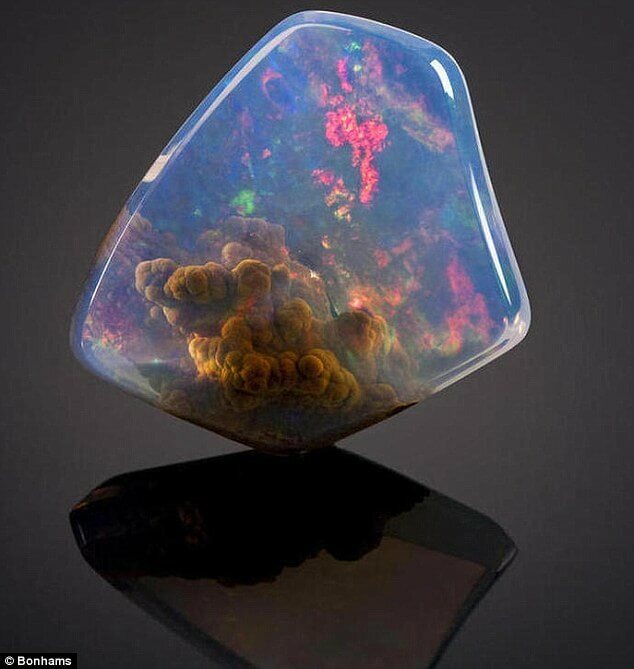 In most opal the light has to fall on the front of the stone to see the play of fire. ‘The piece has a botryoidal jasper formation which forms a unique inclusion,’ Bonhams said. The ‘nebula’ inside is caused by Jasper, a microcrystalline variety of the mineral Quartz. It often contains an abundance of impurities, and therefore some regard it as a rock instead of a mineral. Weighing approximately 119.0 carats, it measures 46.0 x 44.0 x 10.1mm. The Opal was mined in Opal Butte, Oregon. The deposit at Opal Butte has been known since the late 1800’s. Opal is a hydrated amorphous form of silica, and its water content may range from 3% to 21%. It is deposited at a relatively low temperature and may occur in the fissures of almost any kind of rock, being most commonly found with limonite, sandstone, rhyolite, marl and basalt. The national gemstone of Australia, which produces 97% of the world’s supply, the internal structure of precious opal makes it diffract light; depending on the conditions in which it formed, it can take on many colors. Precious opal ranges from clear through white, gray, red, orange, yellow, green, blue, magenta, rose, pink, slate, olive, brown, and black. Of these hues, the reds against black are the most rare, whereas white and greens are the most common.